When I look for the beauty in someone, I don’t let society dictate my thinking as to what it should be but rather how I perceive it. True beauty is a combination of both inward and outward qualities and nothing to do with height, size or colour. We as women are not all the same, we come in all different shapes and sizes and I applaud pageants that celebrate the difference in all of us. Personally, I believe that once your size doesn’t cause any dangers to your health, then it shouldn’t be an issue. On that note, I have the privilege to give you a sneak peek into her life of one of Barbados plus-size models, the beautiful Alicia Clarke, delegate in the Miss Plus Caribbean Universe 2012. The pageant is schedule for September 1st at the Plantation Garden in Barbados. 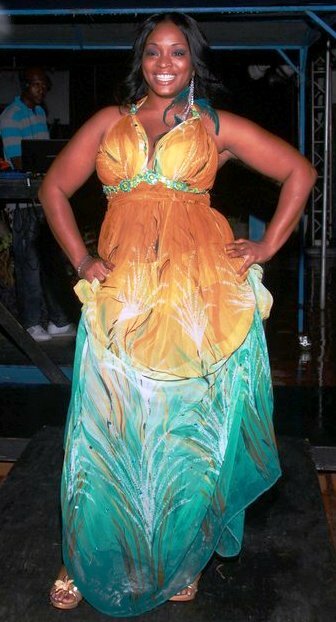 This Barbadian beauty was the winner of 2010 Miss Barbados Amateur Plus Size Model competition. Alicia is currently locally signed with Kingsley Thorne of the Ebony Models agency and she has worked for fashion designers such as New York’s Jewel Shannon and Boston’s Morella Butcher. With a strong personal drive, Alicia believes that her only limitation lies within herself, so she really has no limits as she accomplishes all things she sets her mind to. She has been modelling for 3 years and aspires to be an international plus size model, becoming an advocate for full-figured women and inspire them to be confident, learn to love themselves and embrace their curves. Moreover, she wants women to know it’s not your size but your attitude that allows one to be successful. This positive attitude has helped Alicia to successively manage her time that along with her day job, she utilises her talents as a hair and nail technician to beautify women giving them that extra boost of confidence. Apart from her hectic daily life and concentrating on this pageant, Alicia has taken a step further in the direction of fulfilling her goal as an advocate for fill-figured women, as she will be producing this year’s Miss Barbados Amateur Plus Size Model competition. According to Alicia, the only plus she sees in her life is her happiness. Miss Plus Caribbean Universe Barbados Delegate for more of Alicia Clarke. Miss Plus Caribbean Universe for more on the pageant.